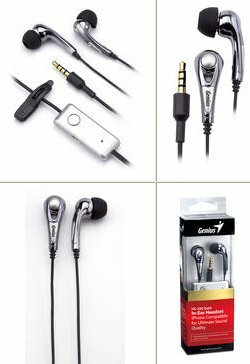 Genius, a leading maker of computer peripherals, highlights their HS-200 Gold In-Ear Headset to the US and Canada markets. Compatible with iPhone, Blackberry, and any other smartphone, as well as other devices, with a universal 3.5mm port, the Genius HS-200 headset is extremely comfortable with its silicone ear buds, and high-quality look and feel. Taking a call is quick and easy with the convenient connect button and sound quality is superb, you get maximum satisfaction when listening to music and watching videos. Telling from the name itself, the connector of Genius' HS-200 Gold is gold-plated, to ensure the best sound quality and reduce noises. The shiny silver colored headphones and microphone box are nicely complemented by the black ear buds and over 1.2 meter long cord. A clip is also included to secure the microphone to your clothing. With a frequency response range of 20Hz to 20KHz, sound quality is great with low bass and high treble notes coming through beautifully. Furthermore, outside noise is dampened extremely well by the soft ear-buds. To provide maximum convenience, the design includes a volume control slider on the microphone box along with a connect button so you can take calls quickly, without any fumbling to grab the phone. The package includes three ear sets of ear buds (S, M, L) and a pouch when you’re on the go. The HS-200 Gold In-Ear Headset is high-quality, convenient, with good looks wrapped up into a very affordable headset.